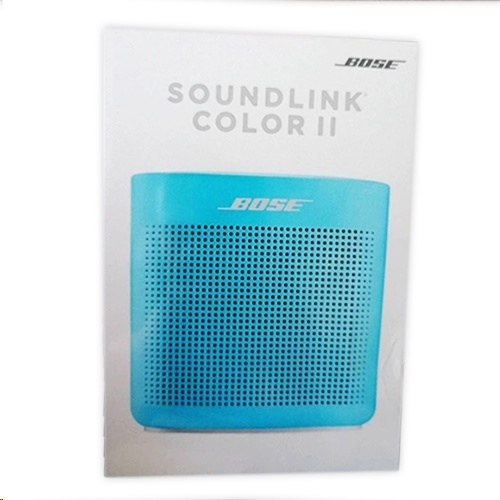 Wireless audio streaming and portability are combined in the aquatic blue Bose SoundLink Color II Bluetooth Speaker. This speaker pairs with other Bluetooth-enabled devices, like smartphones, for wireless music streaming up to 33' away. An auxiliary audio input is also on-board for interfacing wired audio sources, such as tablets and MP3 players. The speaker is equipped with a built-in rechargeable lithium-ion battery that provides up to eight hours of playtime. The SoundLink Color II charges via its micro-USB interface; a cable is included. The SoundLink Color II has a Bluetooth range of up to 33 feet, so you can enjoy your music without wires. Voice prompts talk you through Bluetooth pairing for simplicity, and NFC lets you connect with a tap of your compatible device. The speaker remembers the eight most recent devices you've used and can connect to two Bluetooth devices at the same time, which allows you to switch between them quickly. Alternatively, a 3.5mm AUX jack lets you use a wired connection. A built-in microphone lets you use the SoundLink Color II as a speakerphone. The speaker boasts IPX4 rating for splash resistance. The SoundLink Color II is compact and light enough at 1.2 lb for daily travel. This speaker is designed for ease of use and has on-device power, volume, and source buttons. You can recharge it in a wall outlet or with most USB power sources.